The parish of Our Lady of Loreto in Guayaquil (Ecuador), where there is a community of Servant Brothers of the Home of the Mother, has lived some intense days from December 1st until the feast day of its Patroness, on December 10th. "Full of Grace, the Lord is with you"
We began on December 1st with the novena to Our Lady of Loreto and a big family party, that consisted in bingo, a raffle, concerts, and food for sale. All the money that was collected during the party will be used to continue construction of the parish, especially to finish closing off the towers and the bell tower, to avoid the entrance of water when the torrential rains come during winter time, which will come soon here in Ecuador. Every day of the Novena, the parish missionaries and the Servant Brothers went to one of the 9 sectors of the parish territory to give talks about the marian dogmas. Groups of about 50 came together in front of any house on the street to pray the rosary and the novena,and to listen attentively to the talks about the marian dogmas. On Thursday, December 6th, a group of 23 people received the sacrament of Baptism. The following day, two weddings were celebrated. On December 8th, the Solemnity of the Immaculate Conception, more than 60 children dressed in white tunics received for the first time the Body and Blood of Christ. On December 9th, the Second Sunday of Advent, the parish of Loreto was blessed by the presence of Archbishop Anthony Arregui, who imparted the sacrament of Confirmation to more than 80 parishoners. 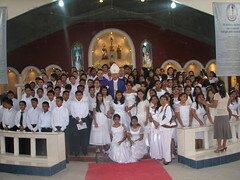 There was also a group of 20 youth and adults who received the Lord for the first time from the hands of the Archbishop. How many graces and blessings the Parish of Loreto has received! 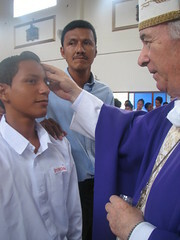 Many new sons and daughters of God through the sacrament of Baptism; a new life and the blessing of God for the two married couples; a great spiritual feast in the soul of every one of those children, youth and adults that received their first Holy Communion; and an army of soldiers of Christ through the sacrament of Confirmation. "The Spirit of God is over this place"
The culmination of all these graces was the Solemn Mass of Our Lady of Loreto, on December 10th. 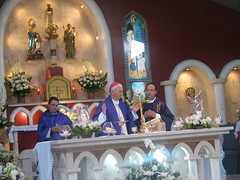 The Pastor, Father Reinhard, S.H.M., celebrated the Mass, with Father Jhon Jairo Zapata, the priest who began the reconstruction of the parish church, as concelebrant. The youth group prepared some sandwiches and chocolate milk for us after the Mass. "Blessed are you among women, and blessed is the fruit of your womb"
Now the parish is preparing itself for the "Posadas", a novena to the Child Jesus, starting on December 15th. We will prepare ourselves so that Baby Jesus can be born into our hearts.